Phozon is an unusual puzzle/arcade hybrid in which the player controls a black molecule with four red spikes. The idea is for the player to align other floating molecules onto their own molecule to create an increasingly complex pattern; this must match the “blue print” molecule that is situated in the middle of the screen. To make molecules adhere to the player’s molecule, the player simply touches the target molecule with their own. 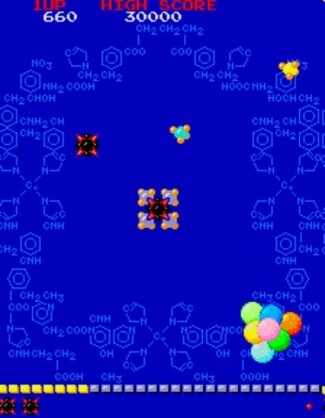 If a molecule attaches in a place that does not fit the pattern shown in the middle of the screen, the player must press the reject button to make if float away. Groups of multi-coloured rotating spheres move around the screen and must be avoided.